Original, quality First World War twin branch brass trench gas alarm horn. 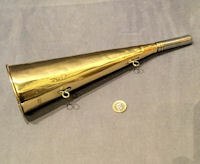 This very unusual example has twin flared and curved trumpet horns with a single mouthpiece and a ring for a lanyard mount, one flared end is stamped "D.R.G.M" and 'Signal' with an arrow through its logo. Polished and lacquered, although the lacquer may be removed at no extra cost, in super condition and complete, when blown a loud twin note is sounded. 5.75" x 3.5" x 1.5". 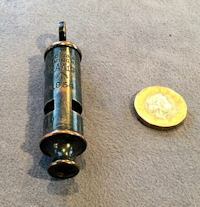 Original, quality late 19th century loud whistle made in cowhorn and impressed "GWR" for The Great Western Railway. Most unusual to find a Railway whistle in cowhorn? Complete and in good and working order. 2.75" x 0.75" x 0.75". 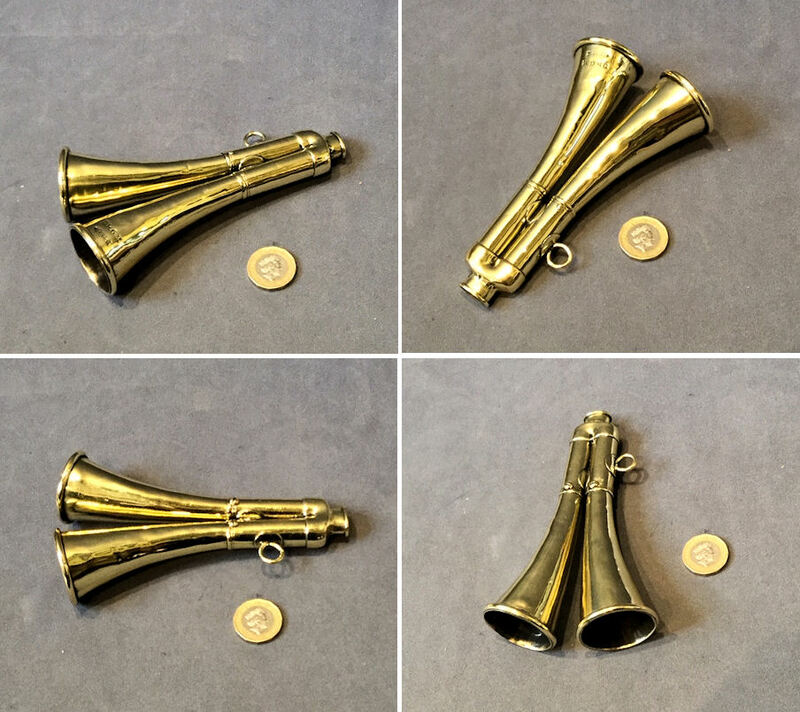 Original, quality 1920's brass "Acme Thunderer" referee shaped whistle with a steel ring. This good example is stamped "LMS" for "The London Midland and Scottish Railway" and is complete and in good and working order with a good loud whistle. 2.25" x 1" x 1". 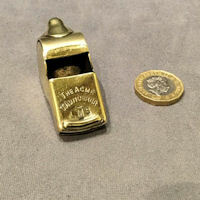 Original, quality 1920's chromed "Acme Thunderer" whistle of the football referee form and detailed "The Acme Thunderer", "Made in England" and "U.A.S" for the University Air Squadron. Complete with ring and in good and working order and very loud. 2.5" x 1" x 1". 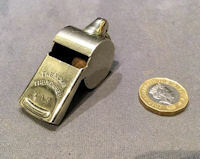 Original, quality 1920's chromed "Acme Thunderer" whistle of the football referee form and detailed "The Acme Thunderer", "Made in England" and stamped "BCT" for Birmingham City Transport". Complete with ring and in good and working order. 2.5" x 1" x 1". Original, quality 1920's nickel plated Police Whistle detailed "Manchester City Police" and for the manufacturer "W. Dowler & Sons Ltd". A very clean and good loud whistle. Complete and in good and working order. 3.25" x 0.75". Original, quality 1920's brass railway warning horn. 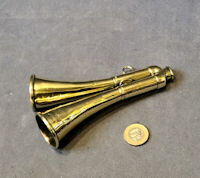 This very loud example has a flared horn with two rings for a strap, a nickel plated mouthpiece with a goods reed inside and the side is impressed "The Acme Made in England". Polished and lacquered, although the lacquer may be removed at no extra cost. Very, very loud and complete and in good order. 13.25" x 4" x 3". 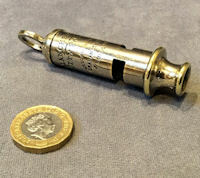 Original, quality pre-war nickel plated police whistle with the original nickel chain and buttonhole hook Detailed "Berkshire Constabulary" "The Metropolitan Patent" and for the manufacturer "J. Hudson & Son 244 Barr St Birmingham". Polished and lacquered, although the lacquer may be removed at no extra cost and complete and in good and working order. 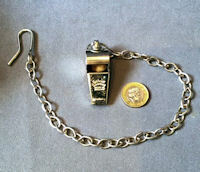 Whistle 3.25" x 5/8" and chain 14". Original, quality 1920's /30's nickel plated Railway Whistle detailed "The Acme Thunderer" and "Made in England" and stamped to the side "L & NER" for the London & North Eastern Railway. Polished and lacquered, although the lacquer may be removed at no extra cost and complete and in good and working order. 2.25" x 0.75" x 1" plus split ring. 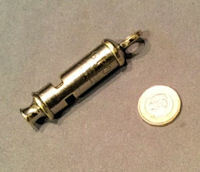 Original, quality military whistle of the police type in the original unused bronzed finish. This example is stamped "J Hudson & Son Birmingham" for the makers', "CNAA 1985", the War Dept broad arrow mark and "1954". Complete and in good and working order. 3 1/8" x 5/8". 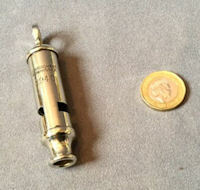 Original, quality pre-war nickel plated police whistle detailed "The Acme City Whistle" and "Kent Special Constabulary". Polished and lacquered, although the lacquer may be removed at no extra cost and complete and in good and working order. 3 1/8" x 5/8". 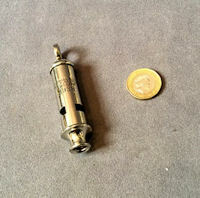 Original, quality post-war unused chromed Acme Thunderer Whistles on the original chromed chain with a buttonhole hook. This example is stamped "Acme Thunderer Made in England" and "B.M.M.O" ( Birmingham Midland Motor Omnibus Company ) . Polished and lacquered, although the lacquer may be removed at no extra cost and complete and in good and working order. 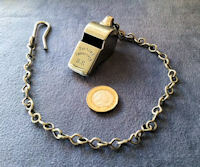 Whistle 2.25" x 0.75" x 1" and chain 14.5". Price is for each. 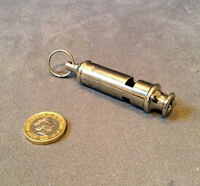 Original, quality 1930's nickel plated Railway Whistle with the original nickel chain and buttonhole hook. 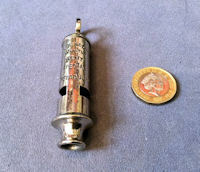 This example is stamped "The Acme Thunderer S. R" and "Patent England" and has a brass name tag attached detailing "J. D. Dixon" for a previous owner. Polished and lacquered, although the lacquer may be removed at no extra cost and complete and in good and working order. 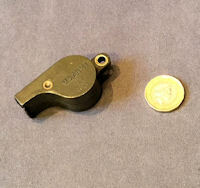 Whistle 2" x 0.75" x 1" and chain 14". Original, quality 1940's nickel plated police type whistle with the original short leather strap with a buttonhole. This example is detailed "J. Hudson & Co Birmingham" for the manufacturer and "973-7001" with The War Dept Broad Arrow. Polished and lacquered, although the lacquer may be removed at no extra cost and complete and in good and working order. Whistle 3" and strap 7". 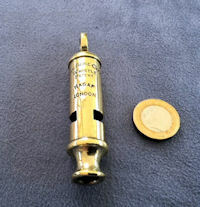 Original, quality pre-war brass police type whistle originally nickel plated, detailed "The Acme City Whistle Patent" and "NAGAF London". Polished and lacquered, although the lacquer may be removed at no extra cost and complete and in good and working order. 3.25" x 5/8". 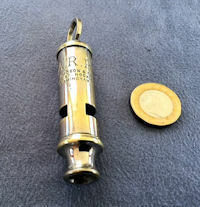 Original, quality Second World War nickel plated police type whistle with the plating worn in places detailed 'ARP.' ( An Raid Personnel ) and for the manufacturer "J. Hudson & Co Barr St Hockley Birmingham". Polished and lacquered, although the lacquer may be removed at no extra cost and complete and in good and working order. 3.25" x 5/8". 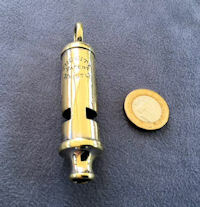 Original, quality post-war nickel plated police type whistle Polished and lacquered, although the lacquer may be removed at no extra cost and complete and in good and working order. 3.25" x 5/8". 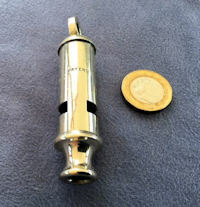 Original, quality 1920's, brass police type whistle originally nickel plated but now polished back to the brass. Polished and lacquered, although the lacquer may be removed at no extra cost and complete and in good and working order. 3.25" x 5/8". 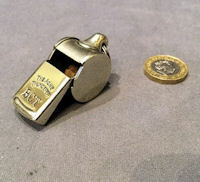 Original, quality pre-war, nickel plated police whistle appears unused, detailed "The Metropolitan Essex Constabulary" and for the manufacturer "J. Hudson & Co Barr St. Hockley Birmingham". Polished and lacquered, although the lacquer may be removed at no extra cost and complete and in good and working order. 3.25" x 5/8" diam. 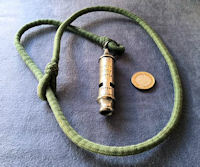 Original, quality green bakelite whistle of the "referee" shape with a brass rivet in the hanging eye at the rear and embossed "US Army 1943" and 'E' within a diamond logo. Very loud and complete and in good and working order. 2.25" x 1" x 1". 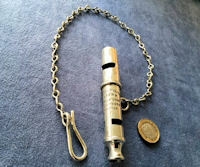 Original, quality post war nickel plated whistle with a split ring to the top and impressed "The Acme Boy Scouts England". Complete and in good and working order. 3.5" including ring and 0.75" diam. Original, quality First World War nickel plated whistle impressed "J. Hudson & Co 13 Barr St Birmingham 1912" and "Hudsons Patent". Complete and in good and working order. 3.25" x 0.75" diam. 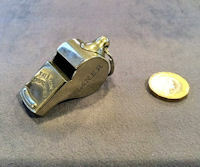 Original, quality 1930's / 40's nickel plated whistle impressed "The Acme Girl Guide Mistress" and "England". This example has the standard ring loop to the top and is complete and in good and working order. 3" long and 0.5" diam. 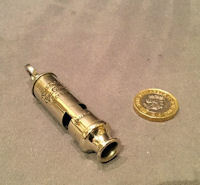 Original, quality Second World War nickel whistle of the police issue shape, detailed '1940' and for the manufacturer J Hudson and Co Birmingham. Polished and lacquered, although the lacquer may be removed at no extra cost and complete and in good and working order. 3.25" x 0.75". 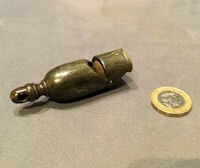 Original, quality Second World War nickel whistle of the police issue shape, detailed '1938' and for the manufacturer J Hudson and Co, Barr Street, Hockley Birmingham. The ring is stamped '433' for the previous owner. Polished and lacquered, although the lacquer may be removed at no extra cost and complete and in good and working order. 3.25" x 0.75". 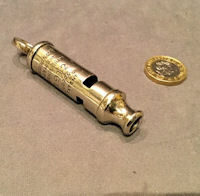 Original, quality post war nickel plated whistle impressed for manufactured "J Hudson and Co, Barr St. Hockley Birmingham" and "G P O" for the General Post Office. These were used by the Postmen delivering letters door to door. 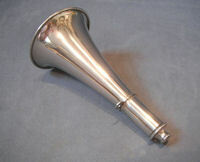 Original, quality, post war, whistle / horn of the trumpet form, in nickel plate and used by the early cyclists. 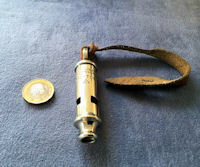 This example is stamped "The Acme Siren", "Made in England" and has the original eye for a lanyard rope and much of the original black interior paintwork is still visible. Polished and lacquered, complete and in good and working order. 3.75" flare and 7" tall. Original, quality, pre-war, chrome plated whistle with a top ring for the chain and engraved "LCC" for London County Council. Probably used by school teachers. Complete and in good and working order. 3" x 0.75".